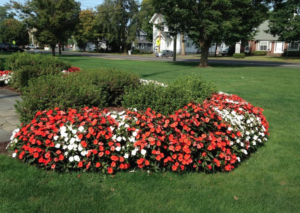 For many years Brian Gonsalves worked alongside Mike “Scooter” Richetelli assisting Gary Lindgren coach the Amity Spartans Hockey Team. This year, he brought that experience with him as he took the helm at Daniel Hand, coaching the Tigers. Daniel Hand was the one team on Amity’s season game schedule whose record most closely mirrored their own. So with those two factors the “away” game on Wednesday, Jan. 23 promised to be interesting. Both teams came out ready to win, but Amity shocked everyone with its first goal in the first 10 seconds on the ice, thanks to Ryan Miller. Halfway through the period Hand tied the game with a goal by Ethan Massey, assisted by Logan Massey. Just 90 seconds later, Griffin Fitzmaurice added a point assisted by Michael McKeon. First Period Score: 2-1 Hand. Amity came out strong in the second period with Cody White tying the game just 5:16 after returning to the ice. Six minutes later, Hand struck back and reclaimed the lead with E. Massey’s second goal of the game. Well, Amity Captain Jason Csejka would have none of that, and tied it up again in 23 seconds, assisted by Nelson Bordeleau. With 27 seconds remaining Holden Prestash, assisted by Tatum Fitzmaurice, pulled Hand back into the lead. Second Period Score: 4-3 Hand. The final period belonged to the Tigers and included two Hat Tricks. It wasn’t the most exciting action we’d seen on the rink, but Hand came alive 11:35 in with T Fitzmaurice’s goal, assisted by John Gagliardi and G Fitzmaurice. Just 46 seconds later E Massey earned his Hat Trick, assisted by L Massey. As the clock ticked down to one minute remaining, T Fitzmaurice scored again and got his Hat Trick. Under the leadership of new Head Coach Michael “Scooter” Richetelli, the Amity Spartans earned a place in the SCC Tournament. Ranked No. 4 in Division II, the Spartans went up against the #1 Guilford Indians on Thursday, March 1. Accustomed to being the top dogs, Guilford was first to score with Jake Watrous making a goal, assisted by Zach Woxland with 4:23 remaining in the period. In the first two minutes, Woxland made an unassisted goal for the Indians and 10 minutes later, Amity answered with a goal by Jason Czejka assisted by Jamie Blum. The Spartans returned to the ice one point behind, yet still determined to stay in the game. But the Indians wanted to show why they are ranked #1. At 1:55 Jack Dacey scored for Guilford on an assist from Jack Ring. This was followed at 4:22 by John DeLucia’s goal, assisted by Ring. Then, at 6:59 it was Ring’s turn to score on an assist from DeLucia. Now, with the score at 5-1, Amity really had to put it’s best foot forward, and defense had to step up its game. at 8:21 Joey Schittina scored on an assist from Colin Hughes, and two minutes later Jamie Blum added a point, assisted by Jordan Conn and Jason Csejka. That was good, but could the Spartans score two more points and tie the game in four minutes? It’s been done before. With 56 seconds left in the game, and one Spartan in the penalty box, Coach Richetelli had to make a tough strategic decision — as he, and many coaches in this situation have done before, he pulled his goalie in order to get another man on the ice, knowing full well that the Indians would take advantage of an empty net. Sure enough, and sadly for the Spartans, Guilford’s Joe Neleber raced across the ice with the puck and slammed it into the net, securing the 6-3 victory for the Indians and their advancement in the SCC tournament. Next Up: The Spartans will play in the First Round of the CIAC State Tournament at the Bennett Rink in West Haven on Tuesday. But they followed that up with two consecutive wins within a week. The Spartans defeated Immacuate of New Fairfield 5-1 on Dec. 20 and then, this past Monday, Dec. 23 they blanked East Catholic 2-0. Without line scores it is hard to write a re-cap of the games, but I am working on that. 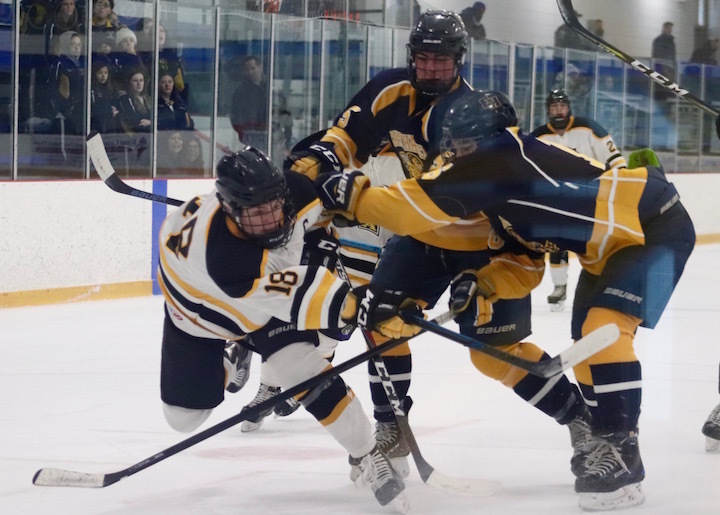 The boys are slated to play two fun games at their home rink — West Haven High School’s Bennett Rink this weekend with the Holiday Tournament tomorrow, Dec. 27 (time to be announced either 1:30 or 4 p.m.) and the Alumni Scrimmage at 7:15 p.m. on Sunday, Dec. 29. Amity has some incredible players again this year so come on out and cheer the team on this weekend and at least at home games for the remainder of the season. 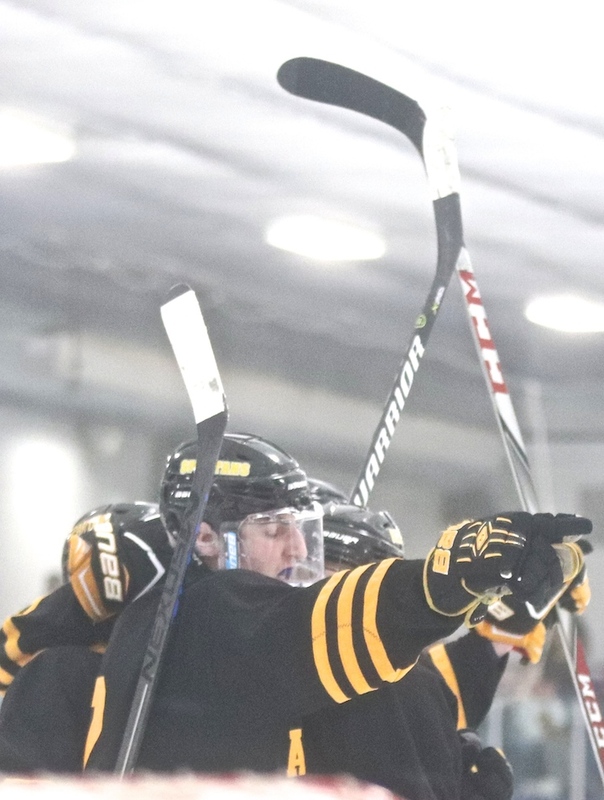 The Amity Spartans Hockey Team has played amazingly well all season long, so much so that it was the top seed going into the CIAC Division II state tournament. The Spartans entered the rink at the Edward L. Bennett Rink Tuesday night for the opening round of the tourney against No. 17 Newtown with all the confidence and drive as ever. 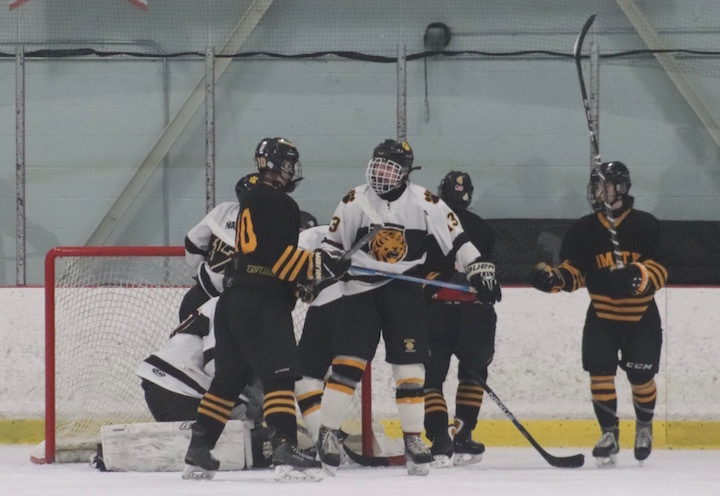 After 10 minutes of intense play in the first period Amity’s Dane Simone scored the first goal of the game assisted by Keating Seymour and Adam Shea. The Spartans held their 1-0 lead throughout the second period, that is, until the very last moment when Newtown’s Evan Isaacs scored with less than one second left in the period. With the second round of the tournament on the line, both teams entered the ice in the third period with playing their A game on their minds. But it was Newtown’s Hayden Savoia who picked up a rebound and shot one in past goalie Nick Nuzzolo at 3:34, besting the Spartans 2-1 and holding that lead in spite of Amity’s best efforts. In the last few seconds of the game it seemed as though Amity had tied things up with a second goal … but it didn’t count. The clock ran out, Amity’s season was over and Newtown advanced to the second round. Amity had a 31-17 shot advantage. Newtown goaltender Patrick Mcloughlin made 30 saves, Amity’s Nick Nuzzolo finished with 15 saves. Amity finished the season 13-8; Newtown is 12-10 and is scheduled to play the second round on Friday.